Features: 15 Amp, 5,000 rpm motor delivers extended power and durability Stainless steel detent plate with 11 positive stops provides repeatable accuracy and jobsite duability Tall sliding fences support crown molding vertically 4-1/2" and easily slides out of the way for bevel cuts Machined base fence support maintains fence perpendicularity with blade for cutting accuracy Cam .. Features: Cantilevering Rail/Cart system allows for 24" ripping capacity - 18" tile on diagonal Only 69 lbs - allows one person to transport and set up tile saw Stainless steel rail system is integrated into the saw frame, ensuring accurate cuts Integrated 45/22.5° miter feature for quick angled cuts Plunge feature allows the user to make quick plunge cuts for .. 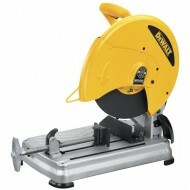 Features: Powerful 15 Amp, 3,600 rpm motor delivers extended power and durability Adjustable stainless steel miter detent plate with 10 positive stops improves productivity and ensures cutting accuracy Precise miter system and machined base fence support optimize cutting accuracy Tall sliding fences support crown molding up to 6-5/8" nested and base molding up to 6-1/2" vertically .. Features: Multi-Cutter offers versatility by cutting a wide variety of materials including ferrous and non-ferrous metals Utilizing a carbide tipped blade allows the depth of cut to remain constant throughout blade life Multi-Cutter cuts 4 times faster than chop saws and 8 times faster than portable band saws in 2" x 2" x 1/4" angle iron 14" 70-tooth carbide .. Features: Powerful 15.0 Amp/5.5 HP (maximum motor HP) motor provides more overload capacity, increasing performance and durability Quick-Change Blade Change System increases productivity by providing the user the ability to change wheels without a wrench Patented Quick-Fence(TM) tool-free, 45° adjustable fence allows for fast and accurate angle cuts without using a wrench Quick-Lock Vise all.. This model has been replaced by the D28710 Features 15.0 Amp/4.0 HP (maximum motor HP) motor provides overload protection, increasing performance and durability Ergonomically designed "D" handle provides a more comfortable hand position, reducing fatigue and increasing productivity Quick-Lock Vise allows for fast clamping on different size materials to increas.. Product Features 15.0 Amp/4.0HP (maximum motor HP) motor provides overload protection, increasing performance and durability Ergonomically designed "D" handle provides a more comfortable hand position, reducing fatigue and increasing productivity QUICK-LOCK Vise allows for fast clamping on different size materials to increase productivity 45° pivoting fenc.. Features: Folds for easy transport Adjusts to four height positions for user customization Robust all-metal construction provides durability ..